My last visit to Ireland was February 1998, so when California friend, Laura, suggested we meet up there this Autumn, I was all in. 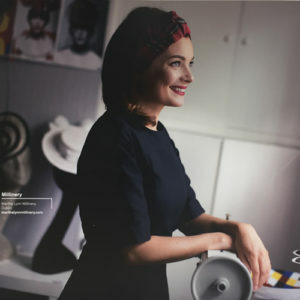 Arriving at the Dublin airport, I was delighted to see a larger than life, image of milliner Martha Lynn, representing the craft of Millinery. 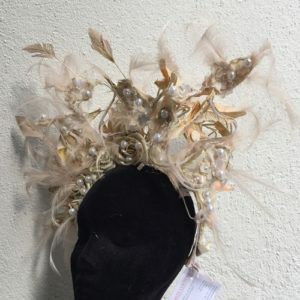 I love when millinery gets visibility, especially on a large scale. Thanks for advice from my London friend, Lis, we went to Bray. It was the perfect balance of things to do without being a busy city. We enjoyed a couple days of coastal hiking, exploring, shopping and a few pints. 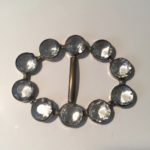 I brought home a little treasure from Greystones Antiques. This simple little buckle I am sure will end up on a hat. 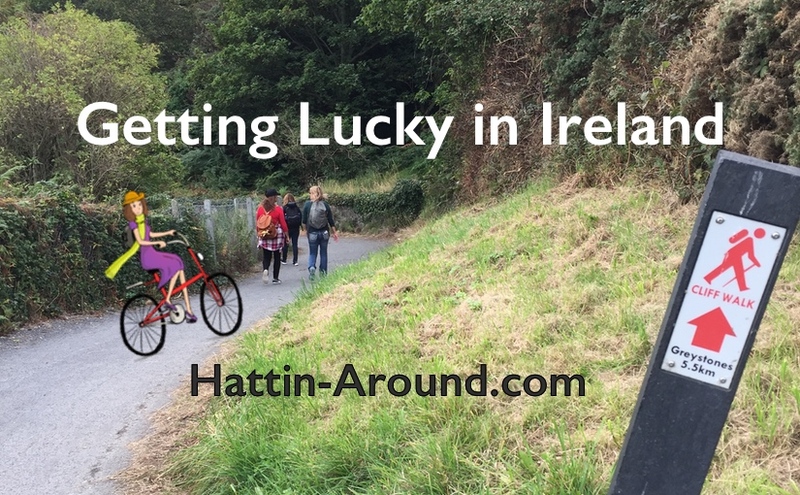 Laura and I headed north to enjoy the streets and treats of Dublin for a couple days before returning to our respective families. We grabbed the first Sightseeing bus we came to, for a quick tour of the highlights of Dublin, then it was time to go hat shop hunting. 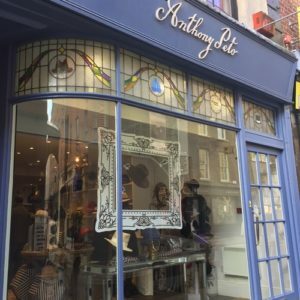 I feel like I found the pot of gold on the first shop, which was Anthony Peto‘s hat shop. Thank you Anthony and Petra for taking time to talk to me without any notice. Anthony’s main showroom and workshop are in Paris where employs a full team of skilled crafts people. 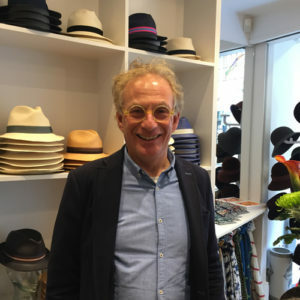 His Paris business has been around for 25 years, while his Dublin shop has been open since 2015. 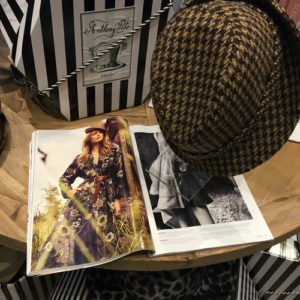 Anthony Peto hats are stylish and well crafted. 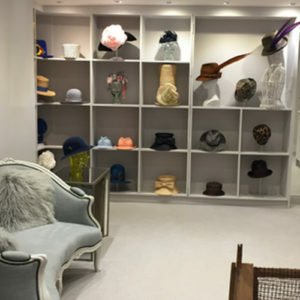 He offers a variety of styles for men and women. 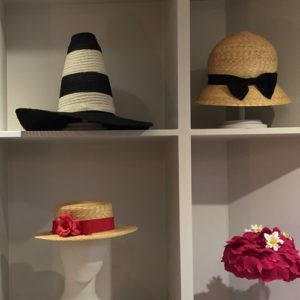 While grabbing the like to his site, I re-discovered this video showing one of Anthony’s team, making a strip straw hat in about 7 minutes. 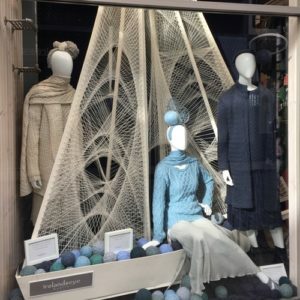 Anthony Peto’s website news page. I would love to have one of those sewing machines and a straw spinner like he is using. 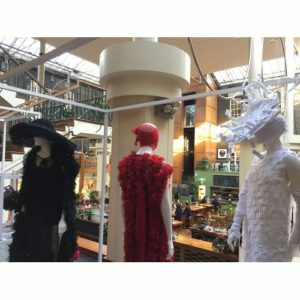 While trying to find another milliner in Powerscourt Centre, Dublin, I stumbled across a costume design exhibit called Frame 7 by Marion Cuddy. 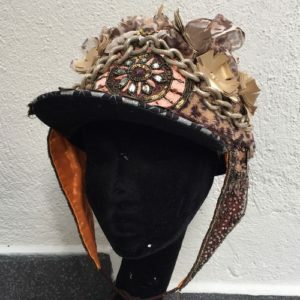 There were some hats, which is always delight. I believe the milliner was Michael Mullins. 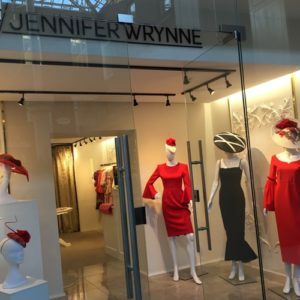 Nearby was milliner and fashion blogger Jennifer Wrynne’s boutique. 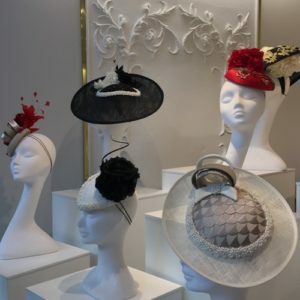 She been a milliner since 2011 and opened the boutique in 2016. 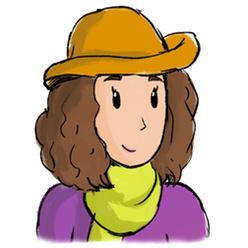 Her hats were primarily special event hats. 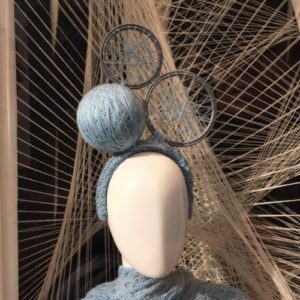 I love window displays that include headwear, especially when it is clever and creative. Thank You, Irelands Eye . On a side note: I wish the fashion magazines did a better job of including headwear in their features. 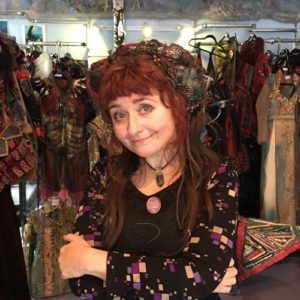 Inspiring, brave and bold, Claire Garvey Couture makes crazy fun hats and clothes. 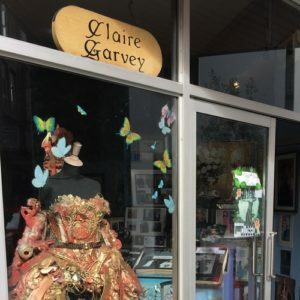 Claire had recently bought her shop after 18 years in business. I think this is what she said, I was so agog looking at stuff I didn’t write it down. Congratulations Claire! 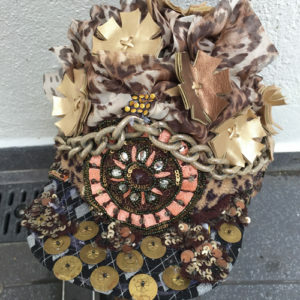 I feel very lucky to have met two amazing hat designers and visit their shops, made a couple of new friends (Kelly & Lynette) and most importantly, connected with my long time friend, Laura. Until next time, Ireland, Thank you. Your talent, motivation and kindness continued to inspire.